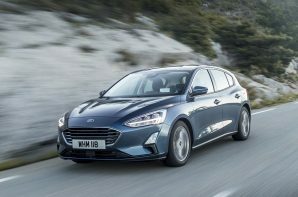 The latest Focus looks to build on the hard earned reputation for class leading driving appeal, whilst addressing the biggest criticisms of previous models, namely a lack of space for rear seat passengers and some below par materials in the cabin which always made the Focus feel like a budget option. To tackle these thorny issues Ford has turned to a new platform which is instantly noticeable if you slide into the back seats. With an additional 50 mm of leg room the Focus now packs what Ford claims to be a class leading 81 mm of space. So that is one problem down, and one to go. Jumping into the front seats reveals a good looking dashboard with plusher materials. It still doesn’t quite match the premium offerings in this class but it is a big step forward. One word of warning, in ‘Style’ trim the central display unit is tiny but you can upgrade to the 8 inch unit which all other models get. It isn’t cheap but it does make the interior look much better and it is nicer to use. Pleasingly whilst the button count has been reduced, Ford has kept physical buttons for heating and ventilation controls which earns a big thumbs up from us. So the Focus now has a reasonable interior and full size adults can be transported in the back without crying. But what about driver involvement? The first thing to note is that lower powered Focus’s (including this one) get a less sophisticated twist beam rear suspension set up which has the potential to adversely effect both ride and handling. However in reality there isn’t a big difference between the two setups, but the big surprise is that neither are as entertaining as they should be and we think that the plethora of driver assistance systems have a lot to do with it. The Focus is now average to drive which is a real disappointment after 20 years of delivering class leading dynamics. The Focus has always been the default driver’s choice, but it has fallen back into the chasing pack and no longer delivers the thrills that we have come to expect. However the fact that the Ford remains very keenly priced and now has a much better interior means that it remains a solid allrounder, but it is no longer the default choice.